People Tree is first clothing brand to receive the new WFTO Fair Trade product mark! Celebrate with us! People Tree is delighted to announce we are the world’s first clothing company to receive the World Fair Trade Organization Fair Trade product mark. The mark reflects our commitment to Fair Trade throughout our supply chain. Learn more about the Fair Trade product certification and shop our celebratory 25% off sale! What is the World Fair Trade Organisation? The World Fair Trade Organization (WFTO) is the global network of over 400 members, such as People Tree, who are committed to 100% Fair Trade. The WFTO is the authentic voice of Fair Trade and a guardian of Fair Trade values. What is the WFTO Product Mark? The new WFTO Fair Trade product mark benefits all Fair Trade Organisations involved in the process of creating a product. This includes the Fair Trade farmers, suppliers, artisans and trading companies who are all part of the global Fair Trade chain. The Guarantee System provides a guarantee that accredited organizations who have earned the WFTO Product Mark have been ruthlessly audited and are certified as Fair Trade throughout their manufacture. What does the WFTO Product Label mean to People Tree? People Tree is delighted that the Fair Trade label certifies our dedication and compliance to the WFTO Principles of Fair Trade. The audit process looked at every aspect of our business, covering fair wages, working conditions, transparency, capacity building, environmental best practice, gender equality and many more. The People Tree Fair Trade mark serves as a guarantee system for stakeholders, such as businesses, public authorities and consumers, through WFTO’s assessment that People Tree is dedicated to Fair Trade principles and practice. 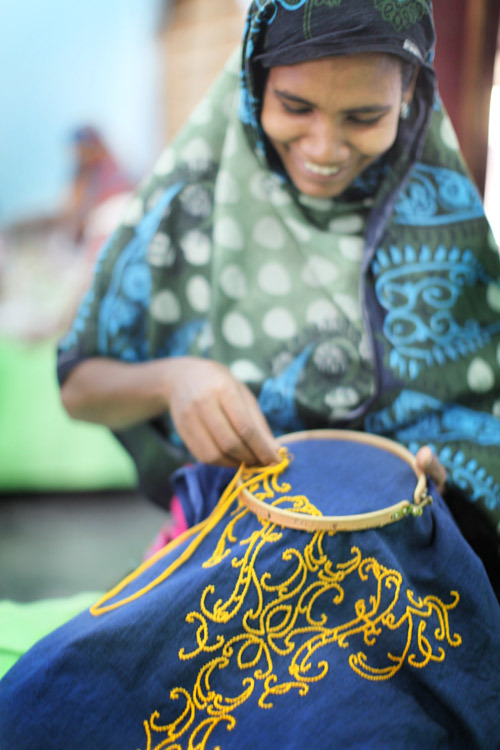 This means People Tree products are 100% Fair Trade from production to sale! What does the WFTO Product Mark mean to People Tree’s Founder and CEO? What does the WFTO Product Organisation President say about People Tree’s Mark? What does the WFTO Product Mark mean to People Tree Producers? What does the WFTO Mark mean to you?! The WFTO product mark means that you can shop People Tree clothing with a smile, knowing that by buying People Tree, you are an integral part to the Fair Trade production process. You have helped strengthen Fair Trade groups, supported environmental practice, community projects, microfinance schemes, capacity building, put pressure on businesses’ to improve their business practice and so much more! Hurry, sale ends Monday 14 October! Posted in Fair Trade, Fashion, People Tree, Safia's Journal•by People Tree•5 Comments on People Tree is first clothing brand to receive the new WFTO Fair Trade product mark! This is great news! Buying fair trade is really important to me, but not always accessible, as so few fashion brands comply. Really proud and excited that People Tree have this product label now, guaranteeing fair trade. This means I can happily promote them on my ethical fashion blog – http://www.wonderchebs.co.uk, knowing that I’m recommending a truly ethical brand. Fair Trade was conceived as a reaction to the unequal trading relations in the international trading arena, where small producers do not have a voice and leverage to demand fair price for their products. The World Fair Trade Organization was formed to unite Fair Trade Organisations and become the voice of Fair Trade. Consistent with our mission of helping producers, especially small and marginalised producers, improve their livelihoods through equitable trading relations, WFTO’s route to equity in trade is through the supply chain, ensuring the whole chain follows the WFTO Fair Trade Standard. The Standard comprises a set of compliance criteria based on the WFTO 10 Principles of Fair Trade and International Labour Organization (ILO) conventions. WFTO prescribed these principles to all trading organisations. From the above explanation, the new WFTO Guarantee System does not certify products but check the practices of organisations using the above-mentioned WFTO Fair Trade Standard. The new system also requires trading organisations to check their supply chain through the Internal Monitoring System (IMS). The IMS is based on the 10 core Fair Trade Principles. By addressing the supply chain of our members, the WFTO Guarantee System endeavours to create an environment where our members strive to improve their practices. While there are strict minimal requirements that are monitored, WFTO believes there is always room for improvement. The mandatory requirements set by the WFTO Guarantee System include compliance with the core principles for suppliers. This in effect also monitors the conditions in which products are made. After the transition phase, WFTO aims to have external certification for the WFTO Guarantee System. An important component of the Guarantee System is the Fair Trade Accountability Watch that allows the consumers to report compliance issues of WFTO members. On the WFTO website a section is dedicated for the public to use, and we are promoting it to encourage members to strictly comply the principles and standard set by WFTO.